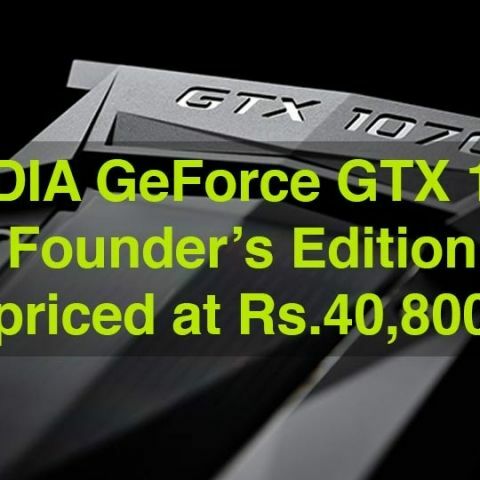 NVIDIA’s GeForce GTX 1070 Founder’s Edition goes on sale globally today and in India, it is priced at Rs.40,800. We did spot the ZOTAC GeForce GTX 1070 Founder’s Edition graphics card priced at Rs.45,999 on Amazon.in which is quite high but certain websites are selling the card at the official price. The US pricing for the card is $379 and the Founder’s Edition is priced at $449. This translates to Rs.30,000 (1 USD - INR 66.80) as per today’s rates. So we’re literally paying more than 35% for the same graphics card which seems to be the usual practise. If you haven’t seen them already, here are the specifications of the GTX 1070.